I will never forget my principal interview in June of 2015. As I walked through the front doors of the district office in Lexington School District Three, I was warmly welcomed and handed a sheet of paper. Little did I know that this sheet of paper would transform my thinking, and lay the blueprint for everything I would do in the days to come. As I waited in the lobby, and began looking at The Profile of the South Carolina Graduate (which by the way, this was the first time I had seen this), I reflected on my beliefs as an educator, and how I could implement the world class skills and life characteristics that were a part of the profile. So many thoughts were racing through my head. As I was greeted by the superintendent, Dr. Gary, and began the interview, my vision started to come to life. I wanted to put the tenets of good instruction and student engagement into place. I wanted to build a team that would be collaborative. I wanted to create a school culture that would set the tone for excellence. But what would this look like? A 40 minute differentiation block for reading and math small groups. A PBIS lanyard and pin system to address the needs of the whole child, and simultaneously motivate them. A school culture that would be collaborative in nature, coupled with a “whatever it takes” mentality to close the existing achievement gaps and grow all learners. These were all of the exciting thoughts that I had as I exited the Lexington School District Three office and prayed they would give me the opportunity to lead this school. 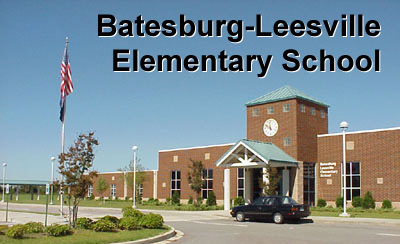 Just a few shorts days later, I was named principal of Batesburg-Leesville Elementary School! I would have the chance to articulate my vision to my staff and students, and hopefully lead them to our goals for the year. The school year got off to a great start in August. As the school year began, it was easy to see what the game changers would be in year one. Our Panther time differentiation block for ELA and Math were implemented and were a huge success. These blocks provided the teachers with a structure to meet with students in small groups and focus on individual learning goals. Teachers no longer had to worry about a time to squeeze in small groups or conduct individual conferences, because this was now built into their schedule. Interventionists “pushed in” to classrooms to provided RTI. Panther time provided us with a common structure and language that we could use to drive student achievement forward. Our kids responded well to this. Engagement levels increased tremendously during Panther time, because we were meeting kids where they were. Our teachers began looking at data in new ways, and using data from formative assessments to determine what would be addressed in Panther time. We also implemented our PBIS Panther PRIDE system, which changed the entire culture of our building. Students earned lanyards and pins based on their efforts and involvement in their learning. This too, was a game changer! It provided the teachers, students, and entire staff with a common language for student expectations and behaviors, and it focused on the positive behaviors that we wanted all students to exhibit. Everyone bought into this lanyard and pin system! As we entered into the next school year, my vision began to expand. The students and staff responded very well to the structures and systems that were put into place in the first year. So we began to dig deeper and think about how to continue to increase the level of rigor. We also wanted our students to take more ownership of their learning. Enter project based learning. We embarked on a three day training in the summer of 2016, and our teachers fervently collaborated, putting the standards at the center of their conversations. They physically cut the standards apart and grouped them together in a way that would call for an engaging project-based unit. PBL came to life that school year! We started small…with only implementing one PBL per nine weeks in each grade level. The level of rigor was instantly lifted, as our students began seeing connections from one content area to the next. Year three. In the spring of 2017, I remember walking through classrooms one day, and thinking, “Okay, so what’s next?” We had solid implementation of Panther time, our PBIS lanyards and pins system was going wonderfully, and our school culture was in an amazing place. It was also during this time that I met Mrs. Betty Bagley at a conference where my school presented. She excitedly shared with me information about the TransformSC network and invited me to meet with her to discuss what TransformSC was all about. We set up that meeting, and the question continued to race through my head, “So okay, what’s next?” What is the missing puzzle piece that will transform teaching and learning and move the school forward? It was during this time that I came across a book that would forever change my thinking, Tapping the Power of Personalized Learning, by James Rickabaugh. As I read the introductory page, I instantly got a feeling in my gut that this was the next step for the students and staff of Batesburg-Leesville Elementary School. We would embark on personalized learning in the 2017-2018 school year and build a three-year plan around this in our efforts to become a part of the TransformSC network. When the teachers returned in August of this school year, we set the theme of “Welcome to Excellence” for the school year. As we all met together on the opening day, I let them know of two major goals for this school year. Goal one: we would apply to become a Transform SC school as we worked to roll out personalized learning. Goal two: we would apply for Palmetto’s Finest. These were two hefty goals, but we had the right team in place to make both of these goals a reality. We had laid the groundwork for innovation, collaboration, and student engagement. I believed in my team, and had the feeling that we could accomplish anything together! As I knew they would, the teachers dove right in with me into embracing these two goals. I could go on and on, but as they say, the rest is history. We were accepted into the TransformSC network in late Fall. Later on this spring, we were named a Palmetto’s Finest School via a livestream announcement on March 20th. I am one proud principal! If I had to pinpoint how these two goals came to realization, a few thoughts come to mind. A clear vision. Involvement from all stakeholders. Constant collaboration. A growth mindset. An attitude that we will embrace whatever is necessary to get our kids to where they need to be. And a feeling of confidence that we are providing all of our students with a world-class education each day.